Club Social with photo-booth and a bokeh table this week, the last of 2016. So we will talk a little bit about Bokeh before completing our examination of light modifiers, in particular the “hard” modifiers (that’s about the quality of the light not the difficulty of use), and wish you all the best till next year. Bokeh is, I have a lingering suspicion, the best of , if not exactly a bad, then at least, an unavoidable, thing. It is points of light rendered by a lens in the area beyond the zone of acceptable focus. It has, by association, a certain dream like quality. Whether that association with bleary eyes is as the result of a blow to the head, strong liquor, watching too many ’60’s films, recently arising from a deep sleep or a biological need for spectacles I leave to the individual imagination and circumstances. That’s not the sort of explanation I am trying to provide. That’s between you, your conscience and the likelihood of your significant other cracking your alibi. The shallower the depth of field the greater the area of view that will be out of focus. Bokeh occurs at the point where single light sources lose their shape and become mini suns or circular (sort of) shapes of light. The term is Japanese, meaning blurred or something that approximates to that. It is the product of lens design which in itself is limited by the laws of physics. That blurred area, behind the subject in focus, is formed by circular pools of light where the light has spread out rather than been brought to focus. The patterns formed are diffraction patterns whose edges assume the shape of the lens aperture in the diaphragm through which they pass. The shape (and number) of the diaphragm blades will impact in the shape of the blobs in the background. The size and smoothness are regulated by light source, focal length, aperture and the diaphragm and what constitutes “good” bokeh is purely a matter of personal taste. We started last post to talk about light modifiers, specifically “soft” modifiers. So that leaves the “hard” modifiers. Probably the thing to note first is that hard light is the default with flash/strobes (I am going to use the terms interchangeably). Flash is probably the first port of call for additional and controllable light for most photographers progressing through the hobby. There are a number of pro’s and cons in using it. On camera and off camera flash provide some of the same problems but generally off camera flash, that which uses a separate flash gun, is by far the more flexible option and the one we will be talking about here. More specifically on camera flash is more likely to deliver red-eye, demonising your subjects, the light is harsh and direct and can only come from the direction of the camera. Built in flash is less powerful than off camera, separate units and you can’t always control the intensity of light you do have manually. That isn’t to say that built in flash doesn’t have its uses, just that those uses are relatively limited compared to the more modifiable off camera varieties. Reflectors – your common or garden light modifying accessory, bowl shaped, they have a single but important purpose, to cut down light spill – light that spills to the sides of (a bare) bulb in a strobe (not exclusively) and when using umbrellas or grids. Also below. Grids – Does what it says on the tin. Black tubes formed in a lattice work they are very effective in stopping scattered light rays coming from the (strobe) bulb, creating a thin, relatively soft beam of light, which arguably puts it into the soft category I know, but I think sits better in this list. The quality of light is determined by the density of the grid (the number of tubes in the grid), while the size of the beam (expressed in degrees) is determined by the thickness of the grid. The grid is regulated by gates acting as barn doors, movable flaps on each side which allow for finer, narrower, beam control. Snoot – is a cone which focuses light to create a very harsh, small beam of light. Can be rigid or flexible, allowing for some control. 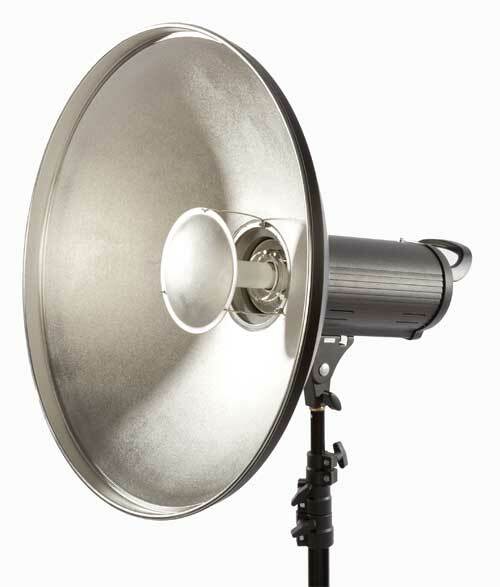 Beauty dish – A small reflector, (usually gold, silver, or white) is placed in front of the strobe / flash, while a bowl-shaped reflector is placed around the light source. This creates a very even, hard light with an extremely sharp drop-off. Used almost exclusively in portraiture, it is very useful as a key light. These are not mutually exclusive pieces of equipment. They can be and should be mixed and matched according to the creative need. They don’t all have to be shop bought, DIY is always an option, but for the bought stuff the guiding principle, generally, is, you get what you pay for, especially when talking about longevity. This in itself can be a function of the frequency and conditions of use, however when starting out, certainly a look round e-bay or other on line shops will throw up some “bargains”. The bargain is what you feel the value of what you have is. There are three other essential elements, not, I would put forward, necessarily directly under the heading of light modifiers as they don’t work directly on the source. These are: flags, scrims and bounces (reflectors). Flags block light. Bought flags tend to be black material, some are paper, stretched over a frame with a small handle to make it easier to place on a stand accurately. Black paper and tape will get you a similar effect to stop a white or light coloured wall from reflecting or for shading specularity in shiny objects. Their primary use is to control light spill and keep down highlights. Scrims are panels covered in diffusing cloth, placed where light needs softened locally. You have probably seen them on film and TV sets, spreading tent like over the actors, in order to provide a soft and even light. Reflectors, other than the ones that wrap around your light source, a.k.a bounces, or bounce cards, can be anything that will reflect enough light to be useful, but are usually white, silver or gold material stretched out on a frame. You are probably aware of the five sided reflectors that also have a black surface and an opaque white that can be used as a scrim. Mirrors are frequently used, especially small ones on product shots. They are usually a way of lightening shadows created by the key and other lights. The type of material determines the light’s quality and, and intensity is a product of the distance from the subject and the reflectivity of the surface used. The black on a five sided reflector, for instance, is used to reduce the amount of light going into the subject. And that, as they say in the World of Onions, is Shallot for 2016. Happy New Year. 5th Jan 2017 19:30 – Editing Images: Bring your laptops and challenge your editing skills. Round 2 of the club competition last meeting and I shall link to the club website here where the winning entries will be posted in due course. Club thanks to our returning judge Roger Mallinson who got though 21 prints and 58 Digital entries in a prompt and informative fashion. To change in form or character; alter. To make less extreme, severe, or strong. With light the second meaning is a consequence of the first, it is also an inescapable consequence and though a tad obvious to some the conclusion is the same as the one that Mark and Rob gave us a couple of weeks back, that if you are going to do a lot of this then it is best to buy yourself a light meter. The reasoning is thus, every time you make an adjustment in intensity or distance (one and the same thing often times) then you are going to effect the elements of the exposure triangle and using the old saying: two measures to one cut as a guide, okay two measures to one slick in this case, means a lot of time effort and battery can be spared. For the occasional user then it is a case of trial and error. Eventually you will get to know your kit well enough to be reasonably accurate in your estimations. There are basically two kinds of light modifiers which we can divide into soft light and hard light. Flash is the most likely entry point for a hobbyist into controlled off camera lighting. With flash we tend to use more of the hard modifiers, that is we use them more of the time, but both categories need considering. The thing to remember, that is the thing not to get carried away with, is we modify light to enhance the subject. It is always about the subject, he, she or it, not about the modifier. Unless you are writing about modifiers I suppose. Still, that false conundrum aside we choose the modifier to light the subject, not the subject to show off the mod as a general rule. The subject is the thing. Always. So this week we will start with soft modifiers. Another term for light diffuser, because diffused light gives soft shadows, that is the differences between light and dark look more a gentle grey than a stark black. Make no mistake we are using the light to create shadow. Shadow is the form of the statement we are making and without light there is no shadow. So a soft modifier spreads the available light over a larger surface, that is, larger than the source itself . Smoothing the transition from light to dark on your subject the main use of soft modifiers is for key lighting in portraiture. The key light is usually the primary light source, the brightest and most important. The two most frequently used soft modifiers are softboxes and umbrellas. Softboxes are normally vaguely pyramidal and lined with a silver, highly reflective material. They come in a variety of sizes and those sizes relate to how soft the light is, not how wide spread the light is. Yes, you are right, those two things are directly related. Most softboxes and umbrellas are used at a distance of two meters or less from the subject. Though there will be differences in the areas lit between any two given sizes, at these sort of distances they are minimal and really, really not the point. The point is how diffuse the light is, how soft the shadows are. Softboxes are a studio staple but they can be very bulky, heavy, require more than one stand and generally take up a lot of space even when not being used and can take quite a time to set up. They are good for using with other modifiers though and also good at controlling light spill (basically light coming through at unintended angles which may or may not intrude on your desired effect). A subdivision of the softbox is known as an Octa, octabox, octadome or octa softbox/dome . Octas, as we will call them, come either as an octagonal shaped softbox or as a hybrid softbox and umbrella. The angle and amount of light fall off is different to a softbox, but they do tend to be a lot more expensive and as bulky as softboxes. There are further modifiers than can be fitted to a softbox or and octa. You can add grids (to give direction), flags (put shadows in), filters (control colour and intensity) to give you a greater control. In case you are thinking, “Hey, I can make my own softbox” then I have to say, yes you can. The difference is in the quality control and the length of time that it is likely to last, but there is no reason why you can’t use tin foil and a cardboard box to put over your light source (flash gun rather than bare bulb, depending on the quality and exclusions of your house insurance and fire damage claims) and a plain shower curtain works wonders (make sure it doesn’t have blue tinge if made of plastic and yes it will melt over a hot bulb). Go ask YouTube, there are many different videos covering this. Essentially umbrellas for modifying light as, opposed to keeping the rain off, come in two varieties: Shoot through and reflective. They are a little more untidy in the way that they deal with light, it will spill round the open edges. They are also prone to having a hot spot which may or may not prove a small problem. They are usually a lot cheaper than softboxes or Octas. A shoot through acts like a lampshade, softening the light simply by putting a semi transparent material between light source and subject. A reflective umbrella is opaque, black on the outside with a highly reflective, usually silver, sometimes gold or maybe white interior. These are pointed at the subject so that the open side of the brolly is facing the subject and the flash unit faces the inside, away from the subject, to bounce light from all round the internal reflective surface from every attainable angle. Umbrellas come in a range of sizes from small to huge (10 feet or more) and they are a low price, effective, portable light modifier. This makes them very popular. As already mentioned their biggest disadvantage is their tendency to spill light around the sides. Not a huge problem, normally, but one which does need to be attended to. Unlike softboxes there really aren’t any effective DIY options, but they can be bought pretty cheaply and so even if there was a DIY alternative the cost advantage would probably be very low. Next week we will be looking at hard light modifiers and it is the club social, see website and or Facebook for details and Rob is doing a Bokeh session to boot.